Editor’s note: this is a revised version of an earlier (16 February) entry in GlobalHigherEd. It reflects my enhanced knowledge about what has been unfolding in Madison WI for the last several weeks. This revised version was posted last week on our Inside Higher Ed mirror site. I stand by the analysis with a further week’s worth of reflection: indeed, the political atmosphere here has deteriorated quite severely in the last three days, almost to the level of farce mixed with brazen displays of political thuggery. It is not very common to see marches of tens of thousands of people in small cities like my hometown of Madison, Wisconsin (with a population of approximately 235,000 people). The issue that drew about 13,000 into the State Capital area on 15 February, 10-20,000 people on 16 February, 25,000 people on 17 February, 35-40,000 people on 18 February, 60-100,000 people on 19 February, and tens of thousands every subsequent day to the present moment, relates to the decision of the recently elected Republican Governor of Wisconsin (Scott Walker) to unilaterally remove the right of public sector unions to collectively bargain about employment-related benefits. The proposal also repeals, in perpetuity, the rights of some segments of society (including day care workers, faculty and academic staff) to collectively bargain at all, and will generate a defacto pay cut for all people associated with universities of 8+% if it proceeds. If this were just about normal budget cutbacks, the political earthquake we’re seeing in Wisconsin would not have happened. This is an effort by a temporary majority — I use the term because in a democracy, all majorities are, in principle, temporary — to rush a bill through the legislature designed to alter the balance of political power in the state. Amazing, and a sign of the intersection of developmental debates at the state level with US-scale political currents regarding class politics, aspirational leadership positioning, and socio-economic networks (including the über rich/conservative Koch Brothers, and their organization Americans for Prosperity, as pointed out by the New York Times, Washington Post, and Mother Jones). Indeed the Koch Brothers have just opened up a lobbying office in Madison, and are launching, today, a $342,200 TV ad in support of Walker according to the Capital Times. The images from Wisconsin — with its protests, shutdown of some public services and missing Democratic senators, who fled the state to block a vote — evoked the Middle East more than the Midwest. 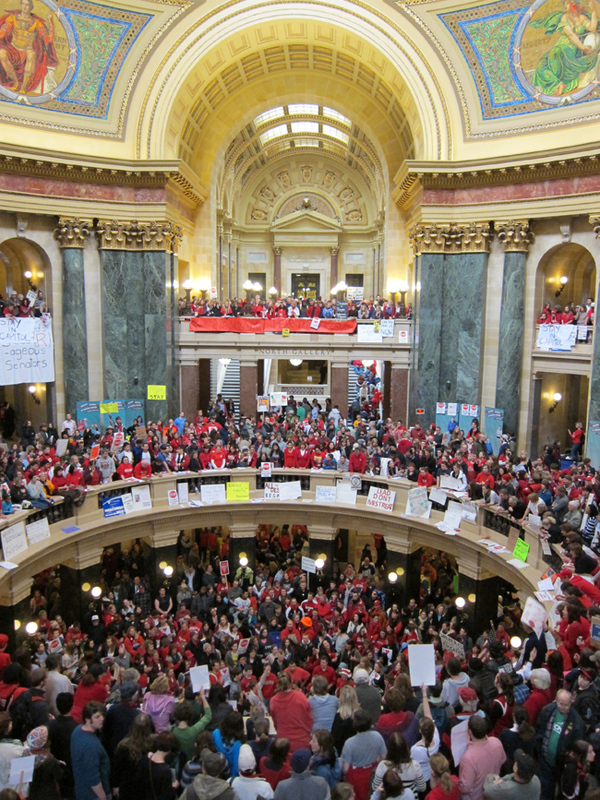 The parallels raise the inevitable question: Is Wisconsin the Tunisia of collective bargaining rights? Governor Walker, in an interview, said he hoped that by “pushing the envelope” and setting an aggressive example, Wisconsin might inspire more states to curb the power of unions. “In that regard, I hope I’m inspiration just as much as others are an inspiration to me,” he said. In short, it has been a return of the mean season. Briefly, in 2008, this frustration was directed against the Republicans. Yet, the Democrats delivered no tangible gains for labour since taking power then, and now, the right has helped steer working-class anger away from Wall Street and back to Main Street’s teachers and public employees. Deftly executed, private sector workers without benefits now blame workers who do have them as the cause of their deprivation. Instead of seeing the gains unions can deliver, private sector workers now take the lesson that these gains have somehow been taken at their expense – all the while ignoring the trough-feeding that continues unabated on Wall Street. The new class war, as it is actually perceived, is not between workers and capital, but between private and public sector workers, with the fires generously stoked by the billionaire Koch brothers and rightwing money generally. One can only imagine Mr Burns of the Simpsons hatching such a scheme in caricature of capital; but this is real, and few seem to recognise the irony as they play out their scripted parts. 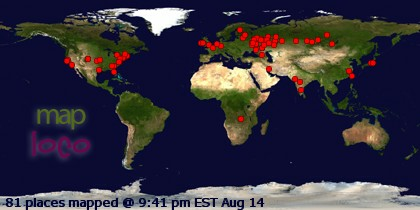 As noted above, the politics and political effects associated with the protests are growing, and getting connected to some stronger national and now international currents, not all of which are based upon a recognition of what is going on on the ground right now, with caricatures of all sorts being inaccurately drawn. In the end, however it turns out, and regardless of political standpoint, it is important for all people to realize the important role, and strongly felt views, and breathtaking energy, of Madison’s university students, and their organizations (e.g., the ASM, Badger Herald, Daily Cardinal, TAA) in engendering critically important discussion and debate here. I really can’t say enough about their commitment, professionalism, good humor, empathy for older and very different types of people (e.g., union members from northern WI), and absolute grace under pressure. And while ‘off-the deep end’ ideologues like Indiana’s deputy attorney general urged police to use live ammunition against Wisconsin protesters (I’m sadly not joking), what will leave a lasting legacy, in ever so many minds, is the critically important role of students (both university and high schoolers) in shaping a window of February 2011 that is of genuine historic import. In closing, here are four short videos that capture aspects of the university (and high school) student presence I noted above. The first three were produced by 22 year old Matt Wisniewski, and the third by PhD student Shahin Izadi. 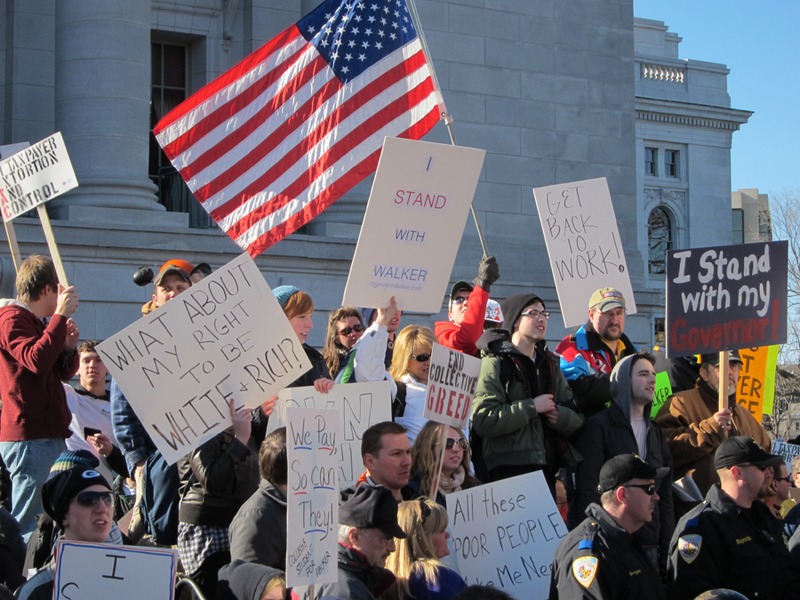 A fourth, by Madisonian Finn Ryan, focuses on the broader segments of society who have also been active, in an equally positive and constructive way, in conveying their dissatisfaction with the Walker agenda. This entry was posted in austerity, USA and tagged Governor Scott Walker, University of Wisconsin-Madison, UW-Madison. Bookmark the permalink. ← What are international dual & joint degrees? I can understand why educators and unions are protesting in Wis. I was an early childhood educator where tenure did not matter because, in the state where I reside unions are not allowed. Therefore, the school system can let you go for any reasons that they feel sound reasonable. Moreover, educators are overworked and underpaid and deserve to receive all of their benefits. Budgeting education will be a problem at the elementary, secondary, and higher education institutes across the United States and other countries because of limited funds. Furthermore, isn’t education the front runner or outlet that prepares individuals for the world and the future? Why not invest and protect the future? Finally, I can see students who are bright and intelligent, who has the desire to educate, but, will not enter into the field of education because of the issues affecting education today in the United States and other countries around the world. Will the issues that affect Wis. public instiutions affect Wis. private educational institutions? These are brilliant videos. I feel some hope as these students are our future leaders. They have a hell of a mess to clean up, but from the actions of these Wisconsin students, they are up to the job, not only for their state but for the nation. This is a very enlightening article. As a person in the education sector with a slightly Republican political ideology, and many outspoken Republican friends, I have heard much about the good of this bill, but this article puts it in an interesting perspective. Overall I think unions are important. Unions were developed to ensure that employers are not overworking their employees. It’s a checks and balances system. However, the struggle comes in to play when the union is asking for things that the employer, the state, can’t afford to give. The one thing about unionized educators that makes me nervous is the idea of tenure. While it is a great security for educators, it also allows, I think, for us to fall in to an attitude of complacency. It may cause a person who isn’t motivated to try less. I think that implementing a more rational review system for pay increases and job security is necessary to ensure proper education for our children. I can understand people views about tenure but, I see tenure as a way to help teachers when they can not do it legally by themselves. Also, most of the teachers I know do not concern themselves with tenure but, providing children with a quality education. The thing that strikes me most about this situation is one man (Gov. Walker) trying to shake up the system as it as been and the working class is taking the brunt of the hit. While I understand the need for cut backs in budgets and leaders trying to find areas for those cut back, these are aimed at the heart of society’s infrastructure. It feels like the more the working class is hurt and weakened by cutting benefits and jobs, it is on the brink of crumbling. In tough times its necessary for everyone to work together. Give and take. Not just take. I think anyone who reads this has in some way felt the changes that come with downsizing. There has to be a breaking point and leaders need to start helping instead of just keeping the chopping block warm. I think, for the most part, unions support workers positively. As I stated earlier, there has to be common ground between fulfilling your duties and recieving proper benefits.